Hello all! 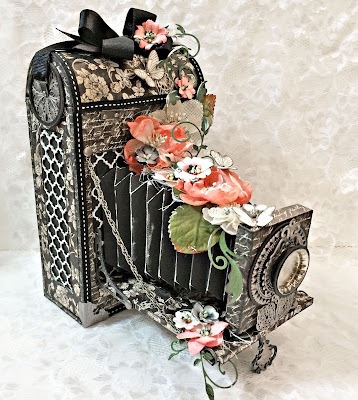 I have a tute today for you on how to make vintage camera baffles. This to me is the prominent feature on those old vintage cameras. If you can make them you can make your very own vintage camera. The rest is just adding a box and a small lid ( where the lens is suppose to go ) and decorating it. This is a long post and I want to give as much information to make it as easy as possible. I wish someone would have took the guesswork out for me! LOL I just seen some patterns on google. No sizes, no instructions, just lots of guesswork. I actually have made several lol working this out. That is the reason why I thought this would be a useful tute to do! I will break this down into 3 different sections Cuts and Measurements, Scoring and Folding, and then Assembly. This is very long and detailed not a way to shorten it.. Lets get started. When I started my first attempt I cut it 6x12 which was to large. I found that a 4x10 piece was a good size to use. So you will need 4 of these cut out of cardstock of your choosing. After you have these cut out you will then need to mark on one end for the first set of cuts. You will be cutting at a angle. Measure in a inch on each side to make the center 2 inches wide. Now place your ruler on the outer edge of the top peace lining up with the mark at the bottom right. should look like this..
And draw your first line.. Now do the same on the opposite side. should look like this when done. Now these are ready for you to place in your paper trimmer and cut off leaving the center. Should look like this when done. Ok now we are ready for the main measurements. These will actually be score lines for the folding process. Starting with the bottom mark left side in a half of a inch and then the right side a half of a inch in. Then do the same to the top. I am calling the short end the bottom and the wide in the top. really doesn't matter because both top and bottom need to be marked the same way. This lays down the first set of score lines. 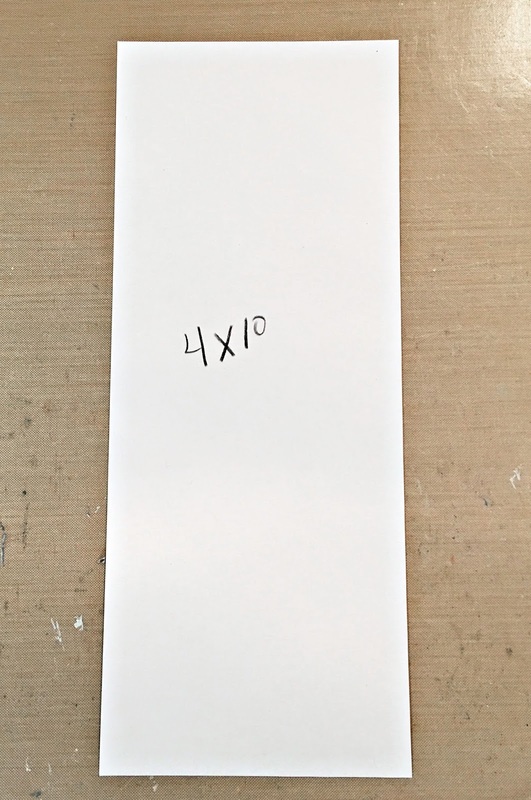 Now line up your ruler and connect the marks from top to bottom. When done it should look like this. Take your ruler and mark every half inch mark. 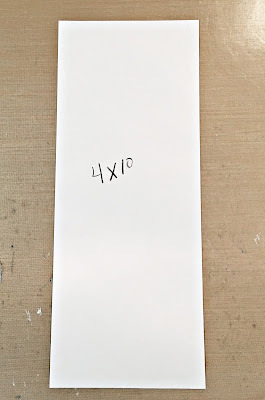 This is easy to do just by laying your ruler on the side of your piece and marking. Mark on both sides. Should look like the below.. Yes I know It may be hard to see the marks, but they are there! Do this to all 4 pieces. Now we are ready to Score! I don't have a handy dandy scoreboard, so I have use a paper trimmer, and a scorer. It worked for me just fine. It also helps keep your piece as straight as possible. 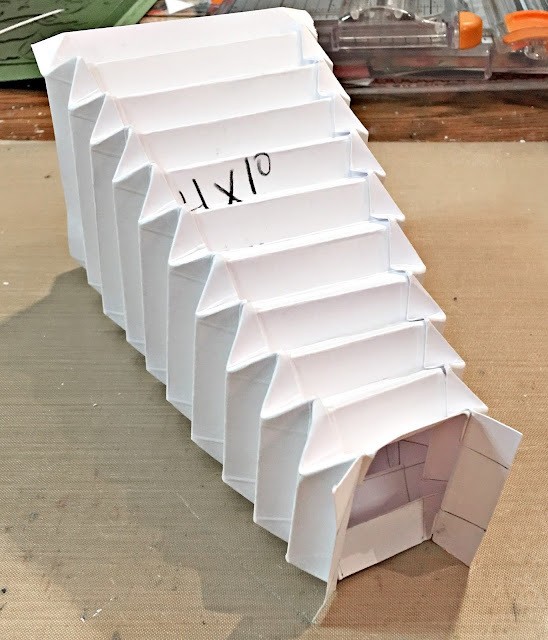 This is so important for lining up later to assemble all 4 pieces. First marks to score is those long lines you have drawn. 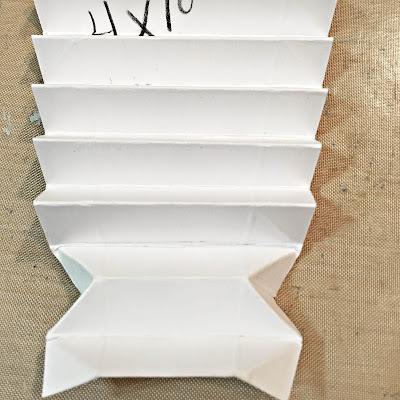 I matched the edge of my piece with the half inch line on my paper trimmer and ran my scoring tool from top to bottom. Do this on both sides where you have your lines drawn. Next lay your piece on its side and line the short end up with the half inch line for your first score line at your first marks. Its easier to line every thing up with the marks, Half inch and inch line so your scores stay level. Go all the way down scoring and checking those lines with your scores. Trust me it will be worth it in the end. When you get close to the end check your back end to line up with the lines on the trimmer to make sure you are still level. After that is done to all 4 pieces your next scores will be along each side at angels. I didn't mark mine all the way. Use your little tick marks and the long score line as references. If you look at them they should make little squares. You will mark from the tick mark at a angle to the inside line. You will do this all the way down on both sides. See pictures for references. I have drawn in some lines on the scores to make it easier to see. The folds will be at every other tick mark. Where your angle meets on the outside edge. Fold back and forth all the way down. Then release and push in at the opposite tick mark to get it to fold in properly. Should look like this..
Do this on all 4 pieces and then flatten back out.. You are ready for assembly now. This is kinda hard to explain. So I hope I make since on this part. Eeek! LOL I recommend Beacons 3 N 1 Glue. It gives you a little work time for shaping. Let it dry for a few seconds before you try to shape. 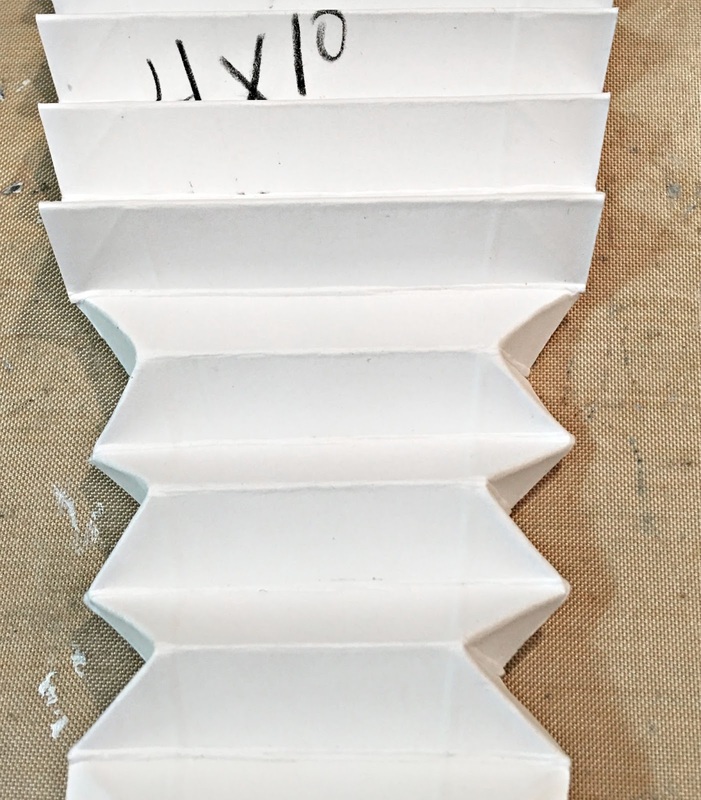 If you line up your pieces first before applying the glue it may make more sense. I use the side that I marked on face up for the gluing process. Take 2 pieces first and line them up off setting by 1 tick mark, bottom to bottom. Lining up with the long score line. Place glue in the valleys of the folds. Should look like this.. I recommend pre shaping a bit before gluing the next piece down. This Just helps the end process.. Should look like this at the first gluing stage. Flatten back out and move to the next section to glue..
Lay your 3rd piece on the opposite unglued side. You should have 1 piece that sticks out farther than the other 2 pieces. That one should be in the middle that is sticking out the fartherest. Glue again in the valley.. Should look like this now..
Reshape again and then you are ready for your last piece to glue before gluing it together to complete it.. This one is a little different. You will want to line up the large 3 section piece to lay on top of the 4th and final piece. Making this piece stick out the same as your middle of your 3 piece section. Should look like this.. Put the glue this time on your single piece in the valleys and line up with the long score marks from top to bottom..
Should now look like this..
Now shape all 4 pieces to start closing them together..
You will want to glue the valley of the piece that is on the opposite side of the glued piece where the center piece will be under. You will have to glue on the inside and then line back up. It should look like this when done..
Now you are ready to create your box! This looks hard BUT it is well worth the effort! I could make these in my sleep now. I think by knowing how it is scored and cut it will help you make smaller versions if your wanted. Just drop it down in size. A little tip.. If you use black cardstock you will want to use a little dab of some paint on each fold so you can see your baffle when photos are taken. I used some 13 Arts Silver Pearl paint on mine. Just gives it a little definition. Here are a couple of close ups on my finished piece.. Thank you for joining me today!! Hope to see you guys give it a go! !